For the last 3 weeks our monitoring team has been very busy observing newly arrived individuals as well as other orangutans we have released since February. As already reported this has been an intense and very exciting time welcoming our first rehabilitated orangutans into Bukit Batikap. All of them are doing well and getting used to the forest. 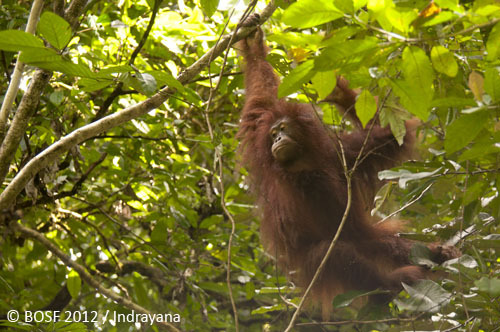 The females have not traveled too far from release sites, but the males have wandered deeper and further into the forest. 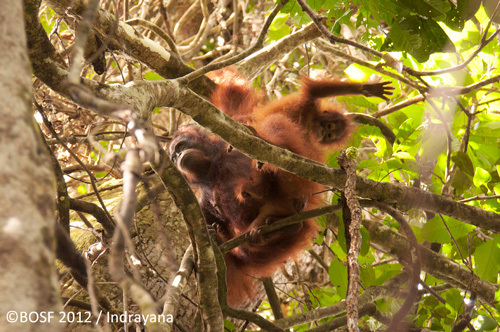 Few of individuals are still staying close to the river like Emen and Leonora with their infants, as well as Menteng. But so far all of the rehabilitated orangutans are behaving better than we expected and we are all very happy to see them adapting so well to their new home. The main focus since the beginning of November has naturally been on our rehabilitated orangutans, however we are also making sure our semi-wild orangutans are doing well. 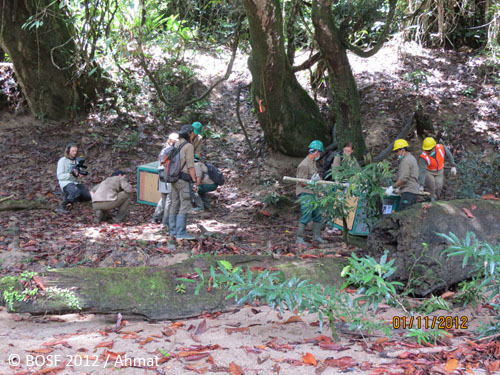 The Monitoring Team traveled to Camp Monnu, the site of the semi-wild releases, and found all of the orangutans: Paluy, Iyos, Kopi, Gundul, Giant, Mangkutub, Jamal and Gusti a week after they were released. Three weeks later, Paluy and Mangkutub appeared to have traveled further into the forest. 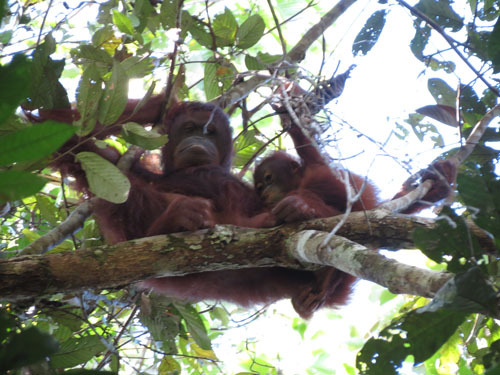 However, we did observe Gusti and Gundul feeding on the same tree. 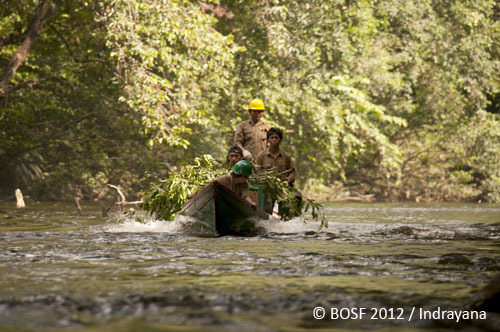 The team also found and followed Iyos who crossed the river. All observed individuals are in very good shape and were not too happy to see people – this is a great sign. 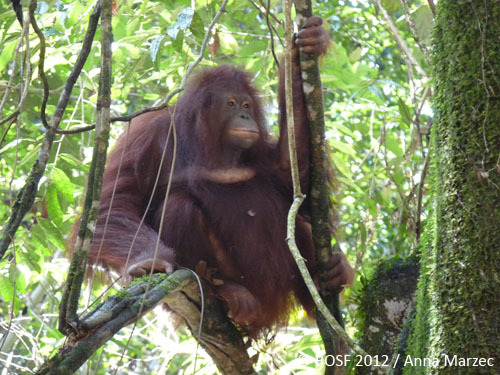 Our team also found Abam who was released a few months ago in August. He is also in perfect shape and his hair has grown as you can see on the photo. 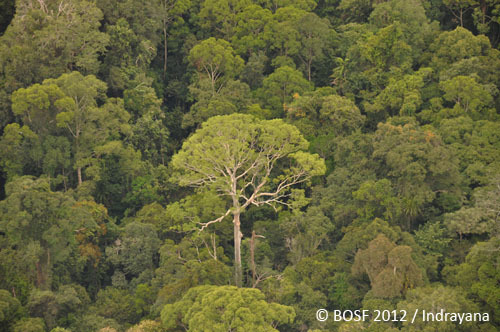 In addition to visual observations, we also recorded signals of many orangutans which are still in the area. All of them are moving around the forest. Despite being busy these last few weeks, we have not forgetten our old gang and we tracked and followed Astrid, Monic, Tarzan, Heldy and Ebol. They are all very well and eating a lot as there are now many fruits available. Tarzan is also traveling a lot lately checking out all the newly arrived orangutans to see if there are any potential competitors. Astrid and Monic are both great, getting bigger and bigger. With each month we are more and more certain both females are pregnant. For the final confirmation we will have to wait 2 or 3 months. Heldy is doing well too and he was seen eating more fruits this month and has put up on a little weight. Ebol spends all her days eating, she can be a bit lazy and sometimes stays on the ground where she finds food rather than take it back up to the tree. The month is not over yet and we are still looking for Ika and Tata to check how they are doing. Other orangutans are being still radio-tracked and we recently picked up the signals of Maradona, Komeng, Mama Tata and Mama Ebol who are now so far that we can only record their presence using radio-tracking equipment. November was definitely one of the most exciting months so far. 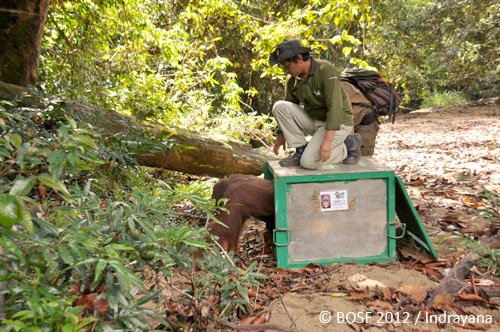 We now have 44 orangutans released in Batikap! During the last release as well as 3 weeks of post-release monitoring our team was accompanied in camp and in the field by the BBC film crew. We can’t wait to see the result of their work. We were happy to have them here and this month has been a lot of fun. Greetings from all members of monitoring team! Yesterday (19/11) and today (20/11) our teams followed some of our rehabilitated females Emen, Leonora, Chanel and Gadis. All four females and their infants were travelling around, finding food and generally ignoring our observer presence. 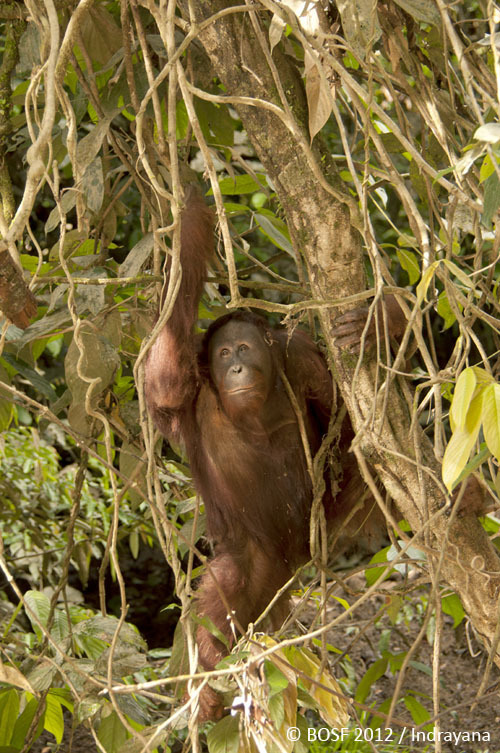 The transition of Leonora from a tame orangutan that could be led into her cage, into a wild orangutan moving through the canopy finding wild fruit, is truly remarkable. Although she occasionally comes to the ground, sometimes making eye contact or moving a small distance towards people, she generally ignores us, has had no physical contact with people since the day of release (now 18 days ago), and has found her own food throughout this time. Long may this continue! Emen seemed to be feeling unwell for a few days, however is now a picture of health again together with her baby Embong. It is very possible that our rehabilitated orangutans sometimes select foods that don’t agree with them and we believe Emen had done just that. 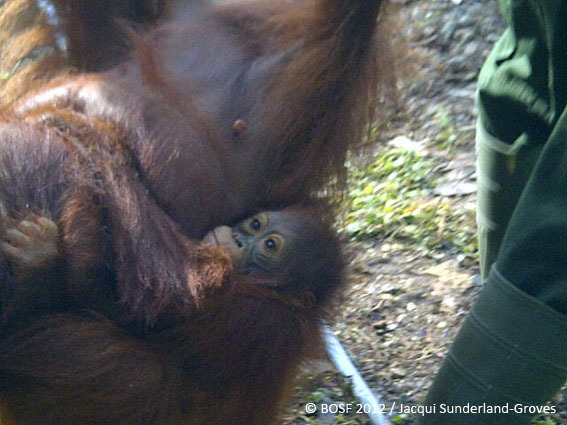 Gadis and Chanel together with their infants are doing great and behaving like wild orangutans should. We believe Sif and Sifa may have crossed the river and that Terusan has travelled a good distance away. Although we continue to pick up Jamiat’s transmitter signal, we haven’t attempted to follow him as he has clearly indicated that he does not want to be near people. Menteng is still staying around the river and was observed yesterday from the boat eating fruit and pith. 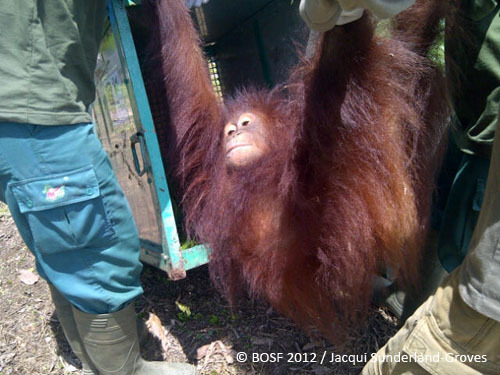 He may have got a bit of a scare yesterday as Tarzan found him, long-called at him and tried to grab him, however Menteng made a hasty exit. 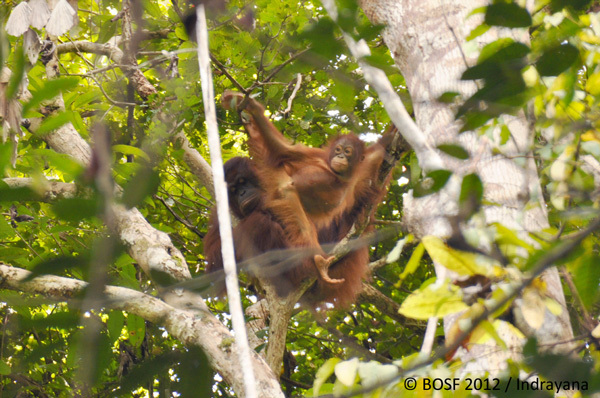 Asides these orangutans, we have also been following Tarzan, Astrid, Monic, Heldy, Ebol and Ika this month. All are looking and feeding well. Other signals recently picked up include Kali, Mama Tata, Mama Ebol, Paluy, Kopi, Abam, Komeng and Sumbing. Keep following and sharing our progress! Menteng has managed to cross the river to the other pebble beach; he has obviously moved south and found a crossing place, then back up to the north again to the area of his release, but this time the other side of the river. The team are not following him as want him to investigate his new home and not focus on them. For now though he is just sticking to the river edges and not venturing far into the forest – he is obviously taking some time to adapt. They did see him eat a wasps nest the other day and getting stung by wasps which didn’t seem to bother him too much. 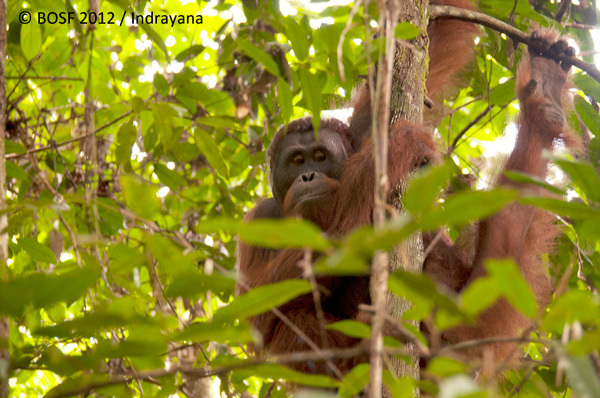 The females (Leonora, Emen, Sif, Gadis) are doing really well and very quickly adapting to become wild orangutans. Leonora is staying in the trees and not the ground (as first feared) which is great. They are not showing any signs of wanting to be close to humans. Astrid had also managed to meet up with these females and hopefully is getting some tips on baby care as we still believe that she is pregnant. The team will leave the girls alone for a while now so they can continue their activities in peace. The team haven’t focused on Gadis as she was clearly not happy with human presence the first morning we saw her and was doing very well. They will be looking to check progress and collect data on Chanel and Terusan over the next couple of days. Ebol is doing well and Tarzan also has been observed and is in good health. Menawhile, at Camp Monnu, the team saw Mangkutub who is fine and was kiss-squeaking at them. Kopi appears to have joined up with Abam (from the 3rd release). 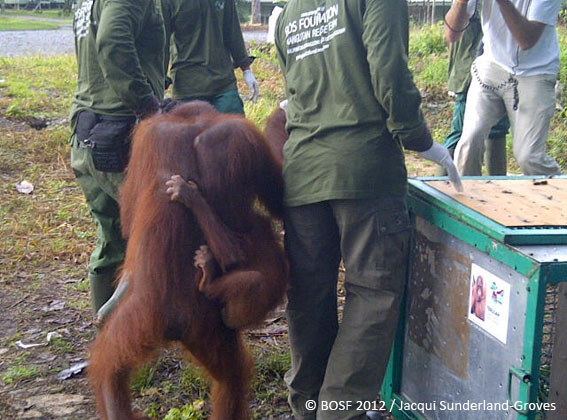 At last we can upload short videos from Nyaru Menteng 4th Orangutan Release. This time we present to you: Jamal, Giant, Gusti, and Iyos. 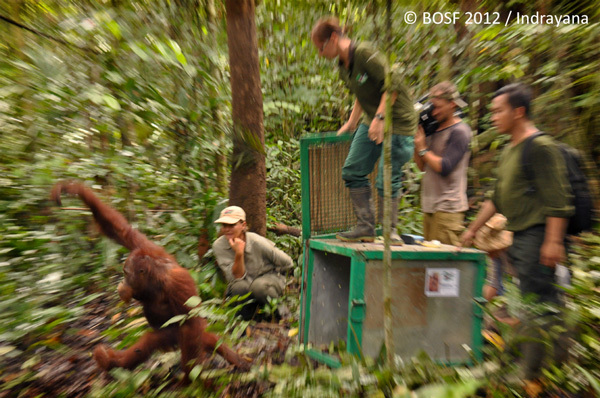 Enjoy..
Nyaru Menteng 4th Orangutan Release 31 Oct – 2 Nov 2012: Jamal from BOS Foundation on Vimeo. 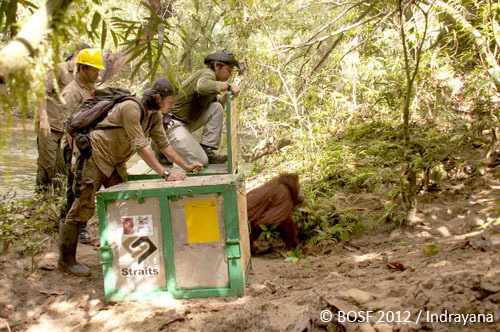 Nyaru Menteng 4th Orangutan Release 31 Oct – 2 Nov 2012: Giant from BOS Foundation on Vimeo. 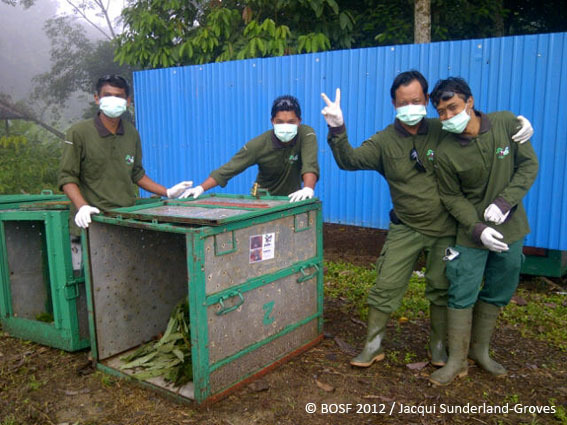 Nyaru Menteng 4th Orangutan Release 31 Oct – 2 Nov 2012: Gusti from BOS Foundation on Vimeo. 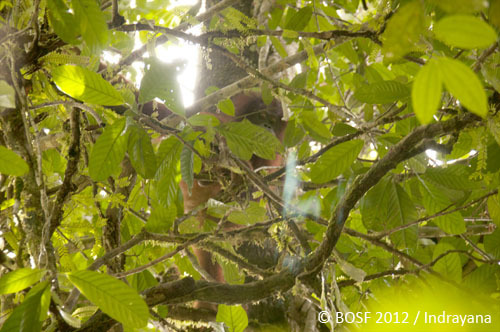 Nyaru Menteng 4th Orangutan Release 31 Oct – 2 Nov 2012: Iyos from BOS Foundation on Vimeo. Stay in touch, we will be back with more interesting updates.. Here is the momentous news you have all been waiting for! 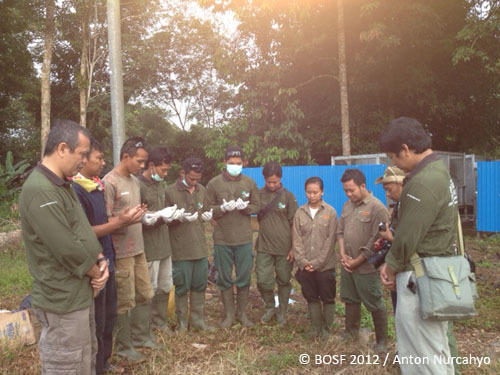 On the 2nd November 2012, we reintroduced our first rehabilitated orangutans from Nyaru Menteng into Bukit Batikap Conservation Forest in Central Kalimantan! 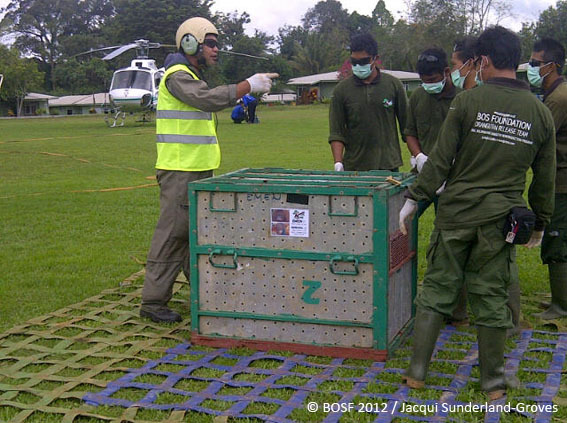 Having safely been sedated and transported in their individual travel enclosures, the first helicopter arrived at a pre-designated point in Batikap at approximately 10.30 am on 2nd November 2012, carrying Chanel and Charlie, Leonora and Lamar, Emen and Embong and Terusan. 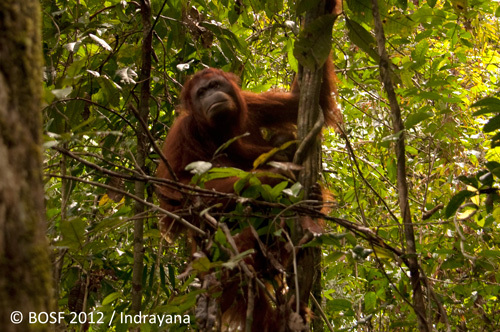 All of these orangutans were released at the end of Transect David. 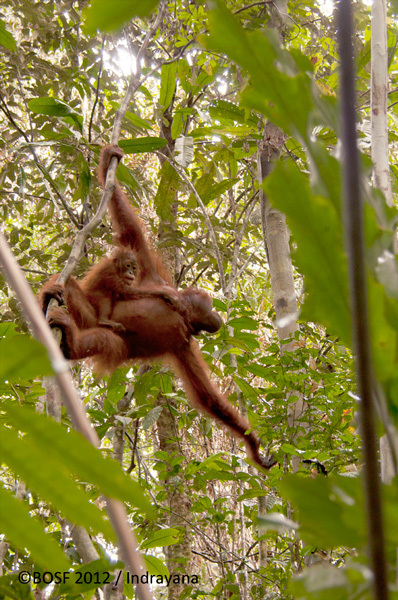 As soon as each of the orangutans were released they all immediately climbed up into the trees. 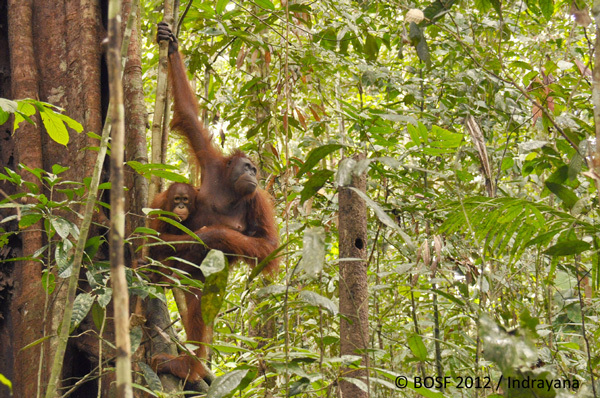 Terusan immediately started moving through the trees and approached Emen, then paused to play with her infant Embong for a short while before moving off towards the North-West. 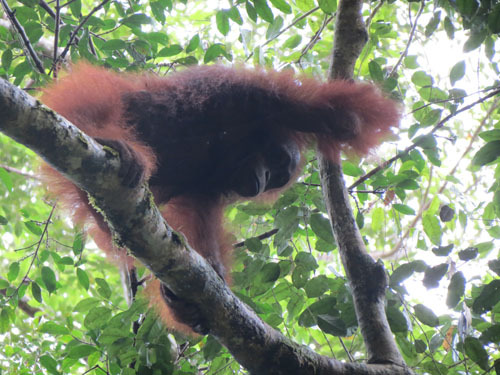 Terusan was clearly enjoying his freedom and was later located after 3pm about 550 m from his release point – he continued to travel northwards..
Emen and Embong stayed close to the release site up the trees where Emen made two nests before deciding that she was happy with her final nest making efforts and stayed there. 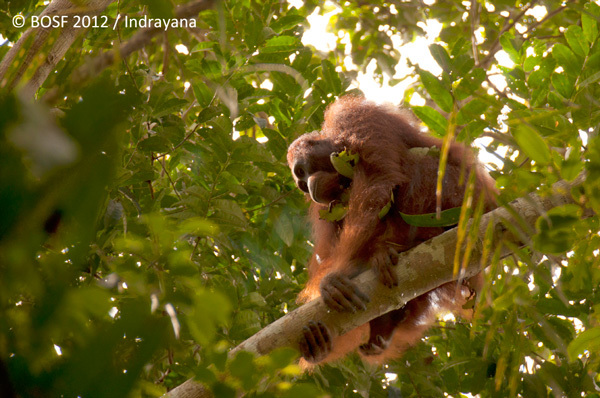 Embong was seen happily eating leaves close to his mum. After their release Chanel with Charlie were located at 2 pm around 300 m from their release location. Charlie was observed trying out an assortment of different fruits. 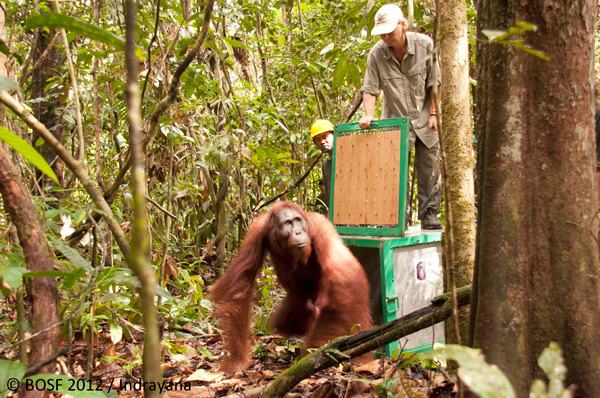 Leonora and Lamar were followed immediately after their release and data recorded on their behaviour. 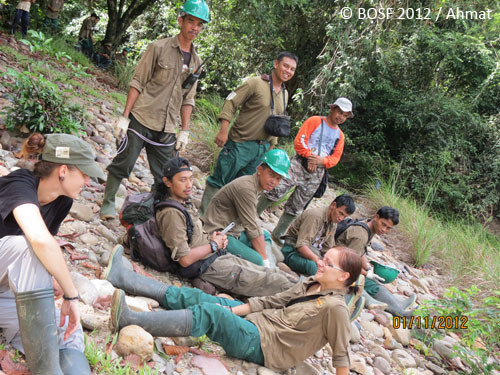 They too moved deeper into the forest soon after release, but at about 3 pm when Leonora heard the sound of the boats arriving to collect the team, she came down to the river and sat on the ground. She tried to approach one of the boats, however the team moved calmly away to leave her to make her nest for the night. Remember that on the pre-release islands, the sound of boats equals the provision of food and it will take time for some of our orangutans to learn that this is not the case in Batikap! 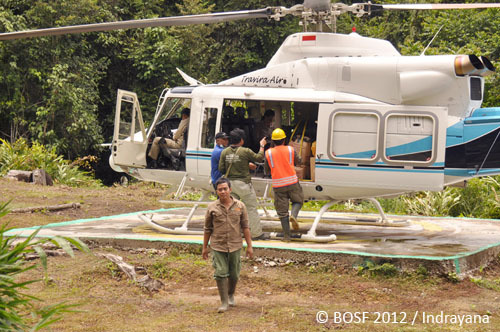 At around 12.50 the second and last group of oranguans reached Batikap by helicopter. Here Sif and Sifa, Gadis and Garu, Jamiat and Menteng arrived! All from this group also quickly exited their travel enclosures and climbed high up trees except for Menteng, who slowly and regally exited his enclosure then turned around and inspected the enclosure, lifting it easily from side to side. Eventually he wandered towards a nearby tree and climbed up. 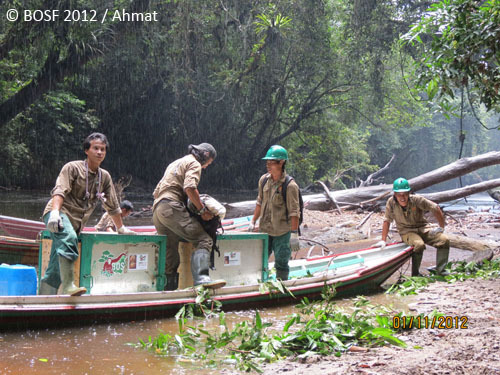 The monitoring teams commenced locating and following the orangutans however Jamiat had started to move quickly away. 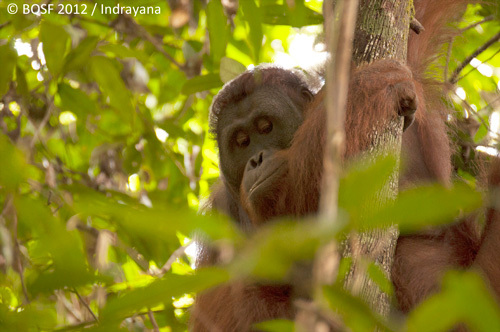 Gadis and Garu stayed locally nearby but out of sight as did Menteng and Sif and Sifa. Once the team were happy with the progress we decided to leave them until the following day. Waiting on the shingle beach for the boats, Menteng arrived on the scene. Being inquisitive as to what we were doing, he tested the water from the mainland to the beach area but found the river was too fast. Not to be deterred, Menteng found a route to the beach using nearby trees to balance. Once on the beach, the team moved back to the mainland and Menteng went back to his river crossing route and followed the team. The team moved back to the beach and this continued until the boat arrived to carry the team away. Menteng was very calm and simply wanted to find out what we were doing and probably wanted to know where his dinner was! What an amazing day for all of us, both human and orangutan alike! 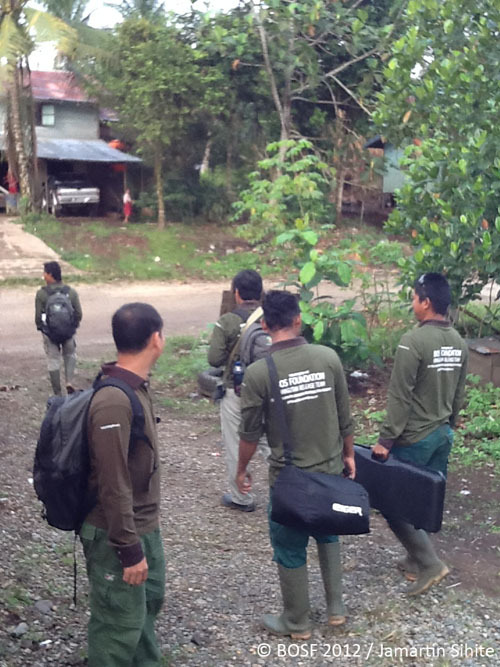 After successfully transporting 21 orangutans back to their home, it’s now time for the some of the release team to go home too to commence planning for the next releases! 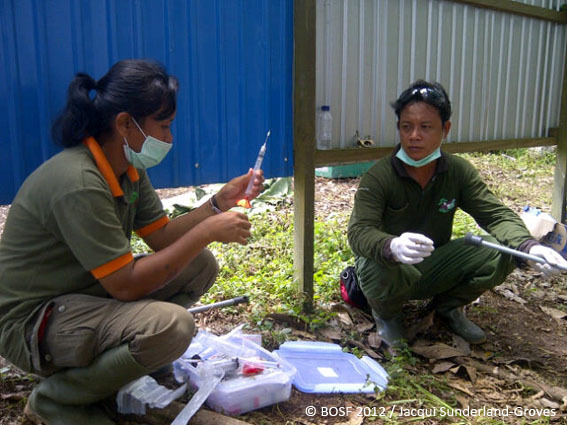 The rest of the team will continue monitoring the oranguans behavior over the coming weeks and months. 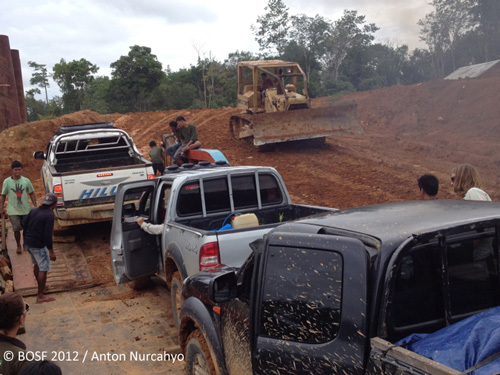 On 4 November 2012, 6 of our team together with the Danish film crew started their return journey from Batikap to Nyaru Menteng overland. Team stopped here to meet with our Comm Dev team and chat to the community members. After 2-3 hours traveling by boat from Batikap, the team stopped at Tumbang Tohan village where they met our Community Development team and chatted to some of the community members. One of our team, Indrayana, stayed in Tumbang Tohan to join work there and the rest continued on. From Tumbang Tohan to Camp B the journey continued again by boat, which takes around 3 hours. Its good to help people as sometimes we too need help! Program Manager Anton, expert technicians; Toni, Muliyono, botanist Kursani and Jacqui traveled back with a couple of people they picked up whose car had broken down. Its good to help people as sometimes we too need help! 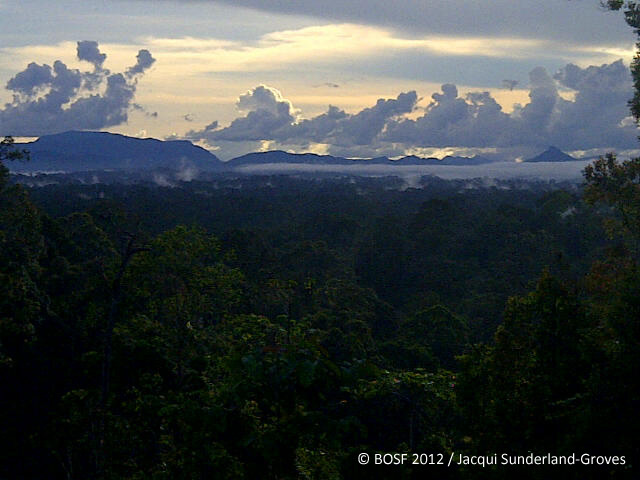 The views along the road between Camp B and Batu Ampar are stunning. 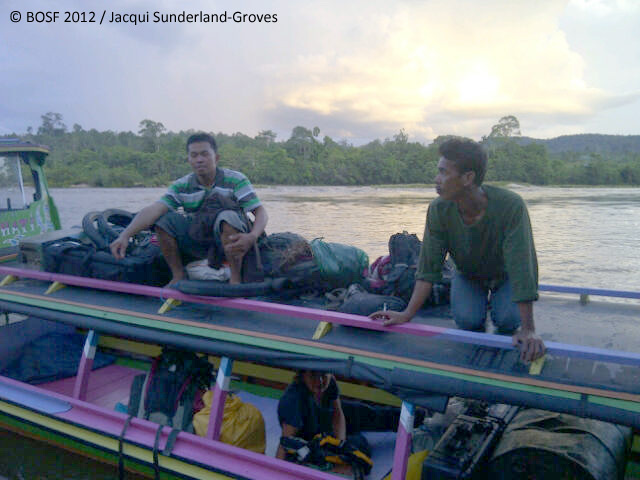 From Batu Ampar, the team again took a boat which delivered them to the overnight accommodation. Night draws in and Muliyono and Toni take a break. A storm set in as the team made their way to their accommodation – a small floating inn. 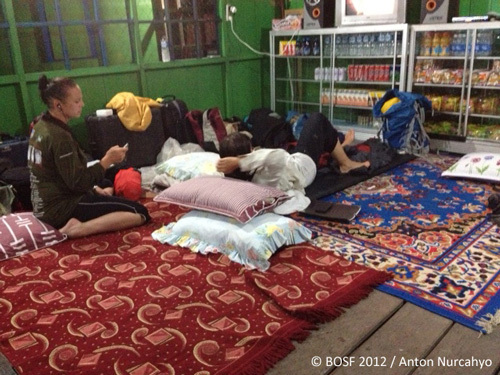 Unfortunately there were no rooms left so, adaptable as ever, the team slept on the floor in the cafe area! But it was great and the team were able to have a well deserved rest. Very comfy accommodation and very kind of the manager to let the team bunk down in the café area! Early the next morning the team woke at 4 and organized their bags to catch the 5 am boat to the next part of the journey. 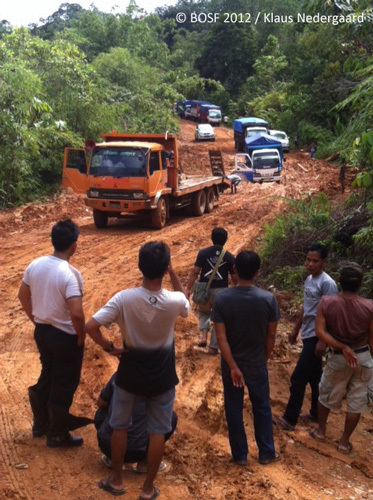 The next part of the route was by road some of which was very muddy and slippery causing several trucks and non-4 wheel drive vehicles to get stuck in the middle of the road. Thankfully, team’s cars were on hand to help pull a few out of the mud and everyone was able to continue on their journeys. Next stop a ferry! Fortunately a caterpillar is on standby to level the loading point. At last around 17:40 the first group from the release team arrived at Nyaru Menteng Palangka Raya safely. 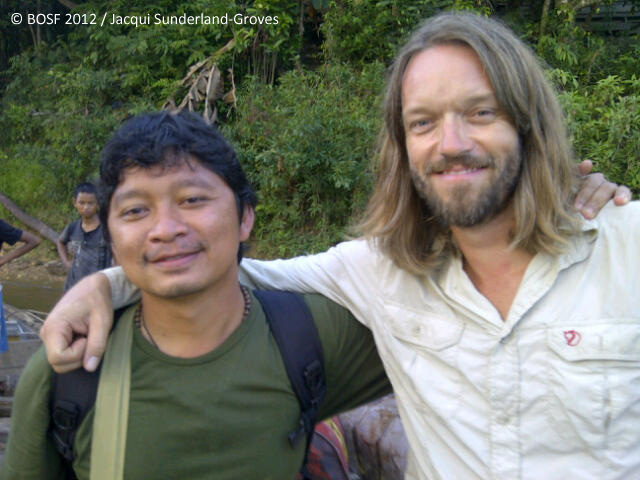 Welcome back in Nyaru Menteng, congratulations for successfully releasing 21 orangutans, have a nice sleep and rest. We’ll be sure to keep you all updated on the monitoring teams results during this very exciting time! UPDATE FROM THE FOREST! 8 Semi-Wilds are Enjoying Their New Home! 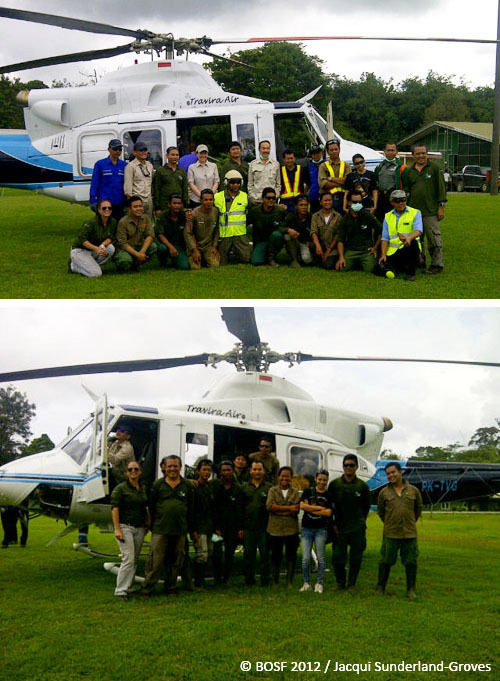 The team in Batikap gave some photos to the last helicopter pilot for us yesterday! 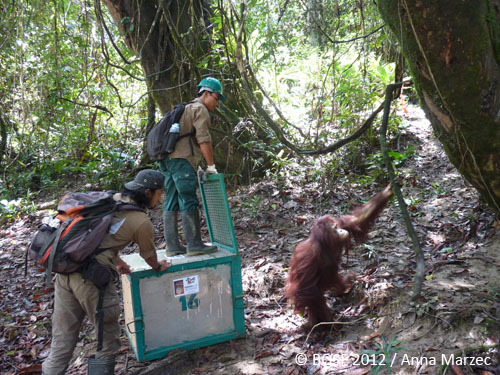 These are photo updates from the first group of orangutans – the eight semi-wilds – released in Batikap on November 1, 2012. As you may remember, the eight semi-wilds were divided into two groups. The first group consisted of Paluy, Gundul, Jamal and Mangkutub. 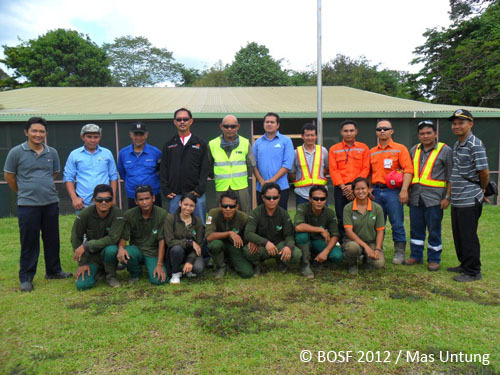 They were arrived safely in Batikap at 10.51 am on November 1, 2012. 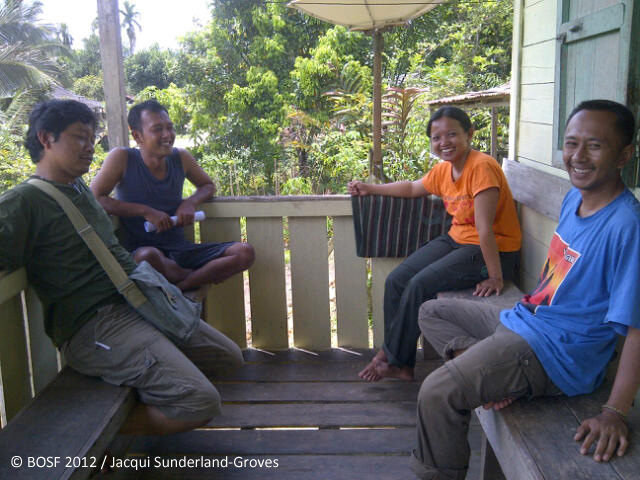 Batikap Camp Manager, Ahmat was there to welcome them and unpack their travel cages assisted by Azis. The journey was not over yet. They had to be taken by traditional Dayak longboats called “kelotok” (if they are smaller, they are called “ces” – pronounced “chess”). 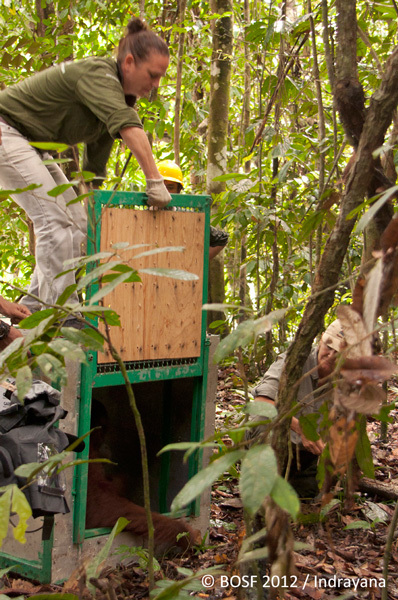 Arriving at the first designated release point, the team must continue the journey on foot deeper into the rainforest of Batikap, carrying each of the travel cages. 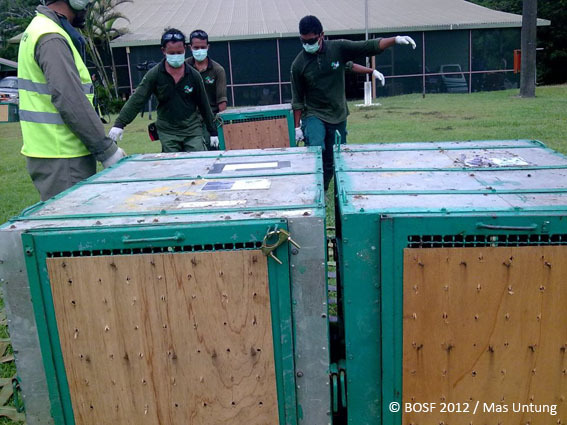 All four orangutans were immediately released. 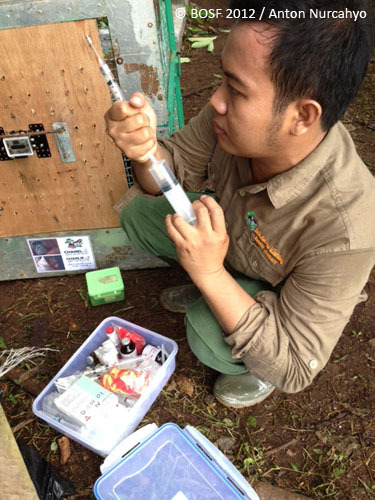 The following photos show our technician Purnomo opening Gundul’s travel cage. She instantly ran to a tree in front of her and climbed it quickly. After which, she found a nice branch to sit on and enjoy her first moments of freedom in her new home! The team then rested a bit while waiting for the second group to arrive. The second group consisted of Gusti, Iyos, Kopi and Giant. Our beloved Lone Drøscher Nielsen accompanied by Nyaru Menteng Program Manager Anton Nurcahyo and our Scientific Advisor Simon Husson was on standby at the second release point. 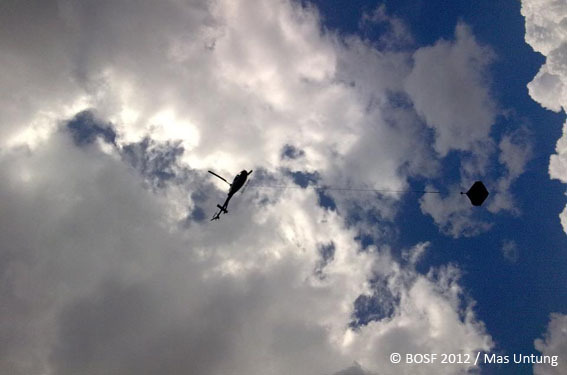 The Squirrel helicopter carrying the second group was finally spotted high in the sky of Batikap! It dropped off the second lot of orangutans at 1.20 pm. The team quickly unloaded the travel cages. The second group about to arrive! In the meantime, the Bell helicopter carrying passengers and logistics also landed shortly. Vet Maryos V. Tandang came on this helicopter. Again, the second group was transported on kelotok to their release points. The first to be released from the second group was Giant. The big guy swiftly climbed the nearest tree. And just like Gundul, he decided to sit on a branch and enjoy the view. Next was Iyos. Once she was in the trees, she was swinging and swinging happily. It was such a heartwarming sight. Then feisty Kopi was released by Lone herself! If you’ve read Kopi’s profile, you’d know that this young lady is very, very wild. She is active and never likes to be around humans. 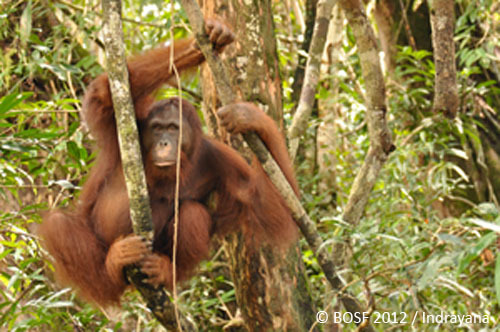 She was the one who escaped from our facility in Nyaru Menteng and lived in the surrounding forest for 13 months! And despite our concerns and worries, she was fine! So as soon as Kopi tasted freedom, it was only to be expected that she hurriedly climbed a tree in lightning speed and “disappeared” among the thickness of the forest canopy. Kopi was so quick! She immediately “disappeared” in the trees! Last but not least, it was Gusti’s turn. Gusti spotted a tree with hanging roots. Perfect! He immediately used the roots to swing and climb and move from tree to tree. The day ended successfully. Eight semi-wilds are home where they belong. 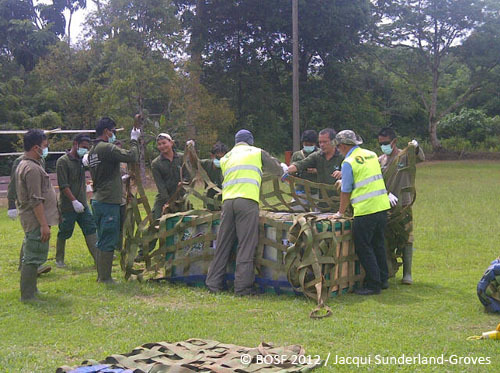 The empty travel cages were sent back to Puruk Cahu and the team retreated to camp to rest. While in Puruk Cahu, after unloading the last empty travel cages, the remaining team members took their time to pose together with our donors and partners from BHP and IMK. 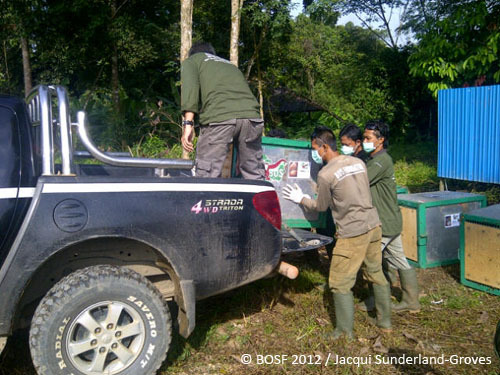 Photos and stories from the next day of orangutan release (November 2, 2012) will be posted when some of friends from the forest return to Nyaru Menteng next Tuesday or Wednesday. All of these photos have also been uploaded on a Facebook album. So while waiting for new updates, you can enjoy them on our Facebook page. Watch this space and we’ll be back soon with new updates! 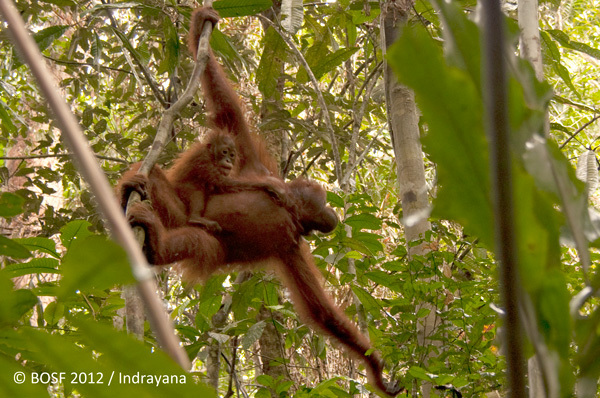 [RELEASE DAY-3] Thirteen of Nyaru Menteng’s First Ever Forest School Graduates are Going Home! The long-awaited day finally arrived! For the first time ever, 13 of Nyaru Menteng’s rehabilitated orangutans – the Forest School graduates – returned to the rainforest canopy where they belong. 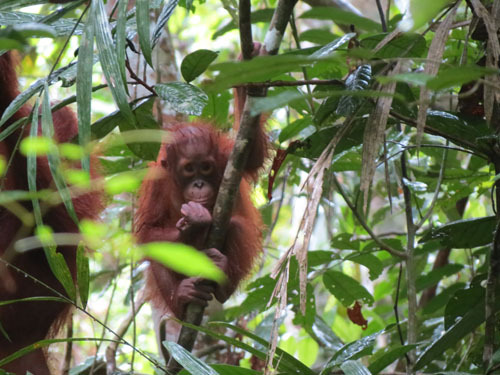 Emen and her son Embong, Sif and her daughter Sifa, Gadis and her daughter Garu, Leonora and her son Lamar, Chanel and her son Charlie, as well as three lads Menteng, Jamiat and Terusan embarked on the momentous homecoming journey to the forest. Just like yesterday, these release candidates were also divided into two groups – 4 travel cages per group. 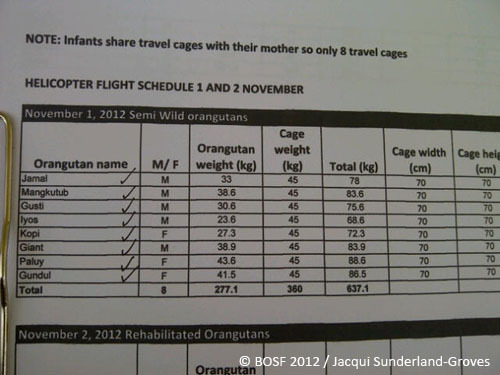 Mother with child shared the same travel cage, while the three males were in individual travel cages. The first group to return home were Emen and Embong, Leonora and Lamar, Chanel and Charlie, and Terusan. The second group consisted of Sif and Sifa, Gadis and Garu, Menteng, and Jamiat. And we were blessed again with clear sky and bright sunshine today! 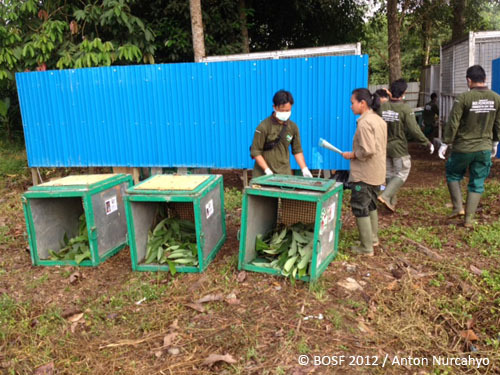 At 6.30 am, the Orangutan Release Team started preparing travel cages, sedation doses, and other details such as truck, helicopter schedule etc. Having sedated Chanel, Charlie was desperate to wake up his mom. So light sedation was also given to Charlie to calm him down, after which he tucked himself in tightly to his mom’s body. Then as Charlie holding on to his mom, they were both gently carried to their travel cage. Luckily baby Embong was not so worried. He simply held on tightly to his sedated mom Emen as they were moved to their travel cage. 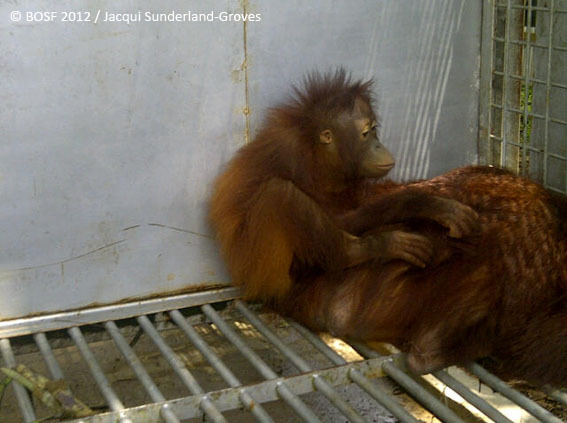 Young lad Terusan was also sedated and soon transferred into his travel cage. Unlike the others, Leonora seemed to sense where she was going and so she coolly came out of her transit enclosure without making a fuss. She did not even have to be sedated. Carrying her son Lamar, she allowed herself to be calmly led by hand to the travel cage. Leonora was amazing! 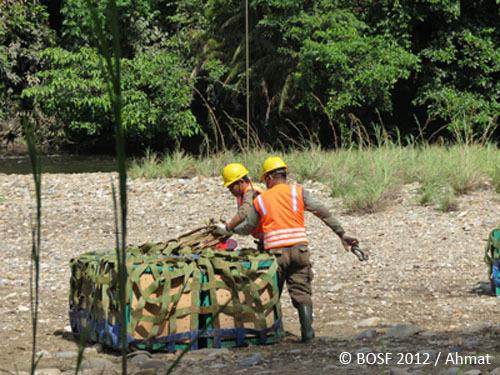 Having transferred the first group of orangutans into their travel cages, they were loaded onto a truck and taken to the helipad. 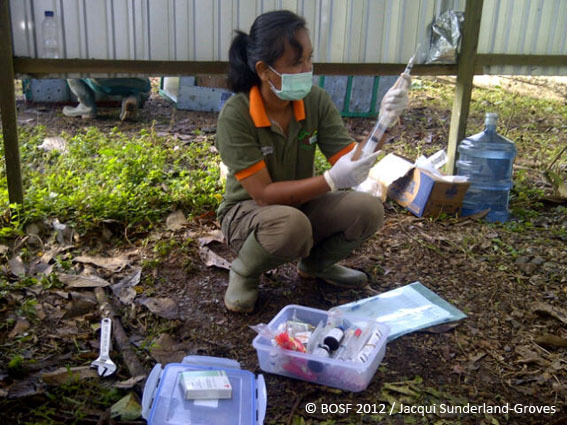 At the helipad, Vet Meriam and her team regularly checked the orangutans’ conditions while waiting for the helicopters to arrive. 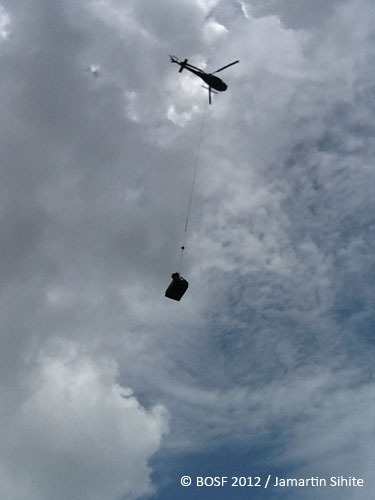 The Squirrel helicopter designated to carry the orangutans on sling load landed in Puruk Cahu at 8.30 am. 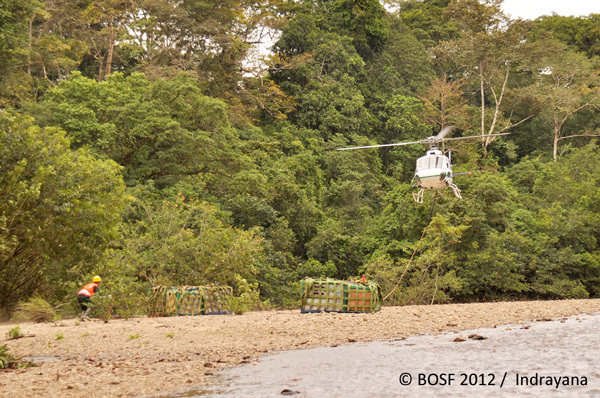 And the Bell helicopter for bringing passengers and logistics into the forest soon followed and arrived at 8.55 am. Sling load net was immediately set up and all travel cages were loaded and secured, closely supervised by Loadmaster John. And at around 9.40 am, the first group of Nyaru Menteng’s Forest School graduates were off! Emen, Embong, Chanel, Charlie, Leonora, Lamar, and Terusan were off to Batikap! 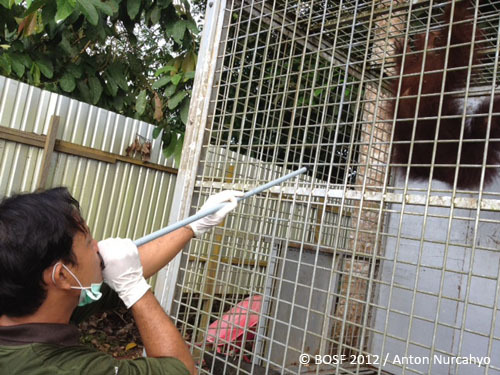 Returning to the transit enclosures at IMK, vet Meriam yet again prepared sedation doses for the second and final group of orangutans. Jamiat and Menteng were first to be darted, followed by Gadis. Sif was the last sedated. Once Sif fell asleep, just like Chanel’s son Charlie, Sif’s daughter Sifa was not too happy about that. 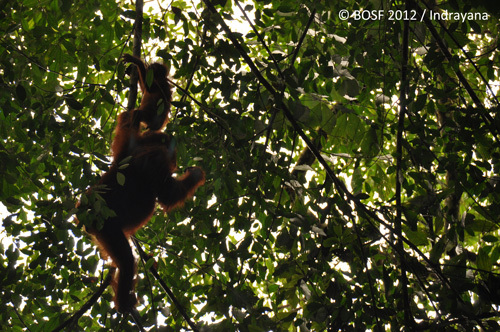 Displaying typical wild orangutan behavior, Sifa made fierce kiss-squeaking sounds as the technicians approached her. So vet Meriam also gave her light sedation. 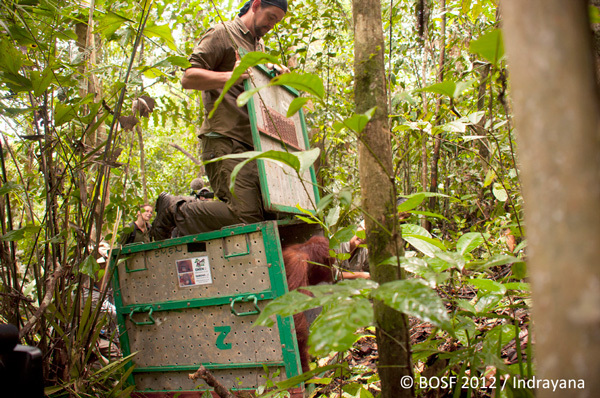 Then, the team began moving the orangutans from their transit enclosures into each of their travel cages. 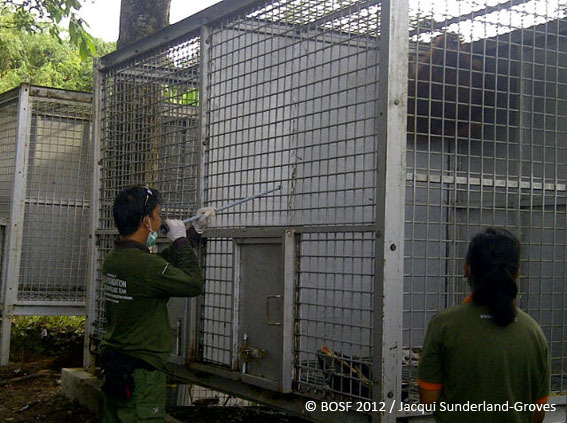 Menteng was the last transferred into his travel cage. The process of loading them all onto a truck was not easy. This lot was heavy! But we finally managed to load the travel cages safely and we were off to the helipad again, waiting for the helicopter to return from Batikap. The Squirrel helicopter arrived at 11.30 am. 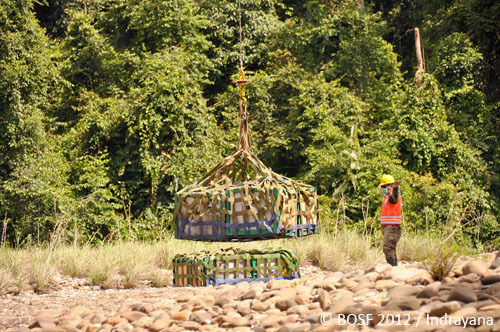 Once it was refueled, the team set the net and loaded the travel cages onto the sling load. At exactly 12 noon, the helicopter took off again bringing home the final group of Nyaru Menteng’s first ever forest school graduates! Gadis, Garu, Sif, Sifa, Menteng and Jamiat were finally flying to their new home! 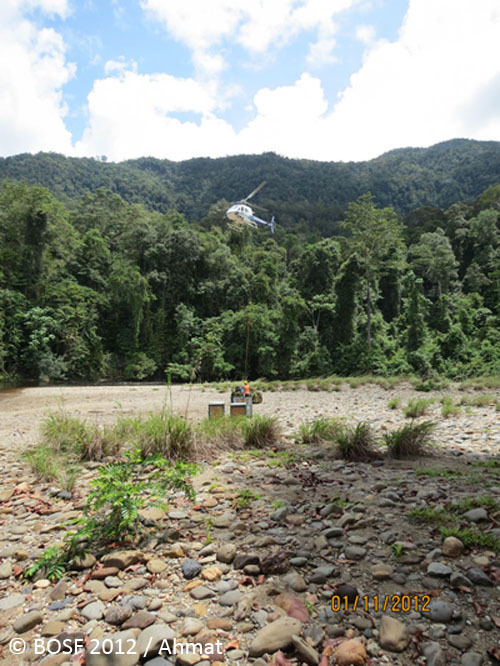 At 2 pm, the helicopter was back in Puruk Cahu with the last four empty travel cages. 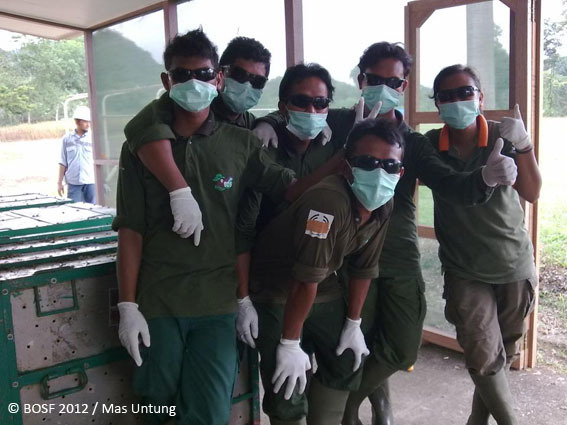 The Batikap Team reported that all 13 of our rehabilitants have been released! Have a great canopy life, our dear friends! We are still here watching over you to make sure you are all well and content in your rightful forest kingdom. 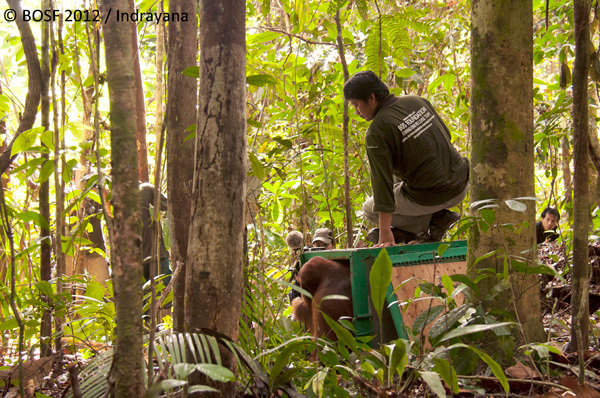 The 4th Nyaru Menteng Orangutan Release activity has ended on a high note, bringing the total number of released orangutans from Nyaru Menteng to 44. Thank you all so much for your support, contribution and participation. Watch this space for more updates from the Bukit Batikap Conservation Forest and follow our Twitter to catch up with other things that we’re doing for our lovely brothers and sisters of the forest. 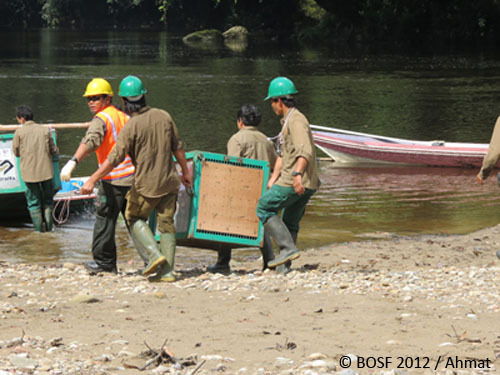 A collection of photos from the 4th Nyaru Menteng Orangutan Release activity can also be enjoyed on our Facebook page. And the complete story of the past three days will soon be posted on our website, too. We bid you farewell for now but will be back in the next few days with updates! 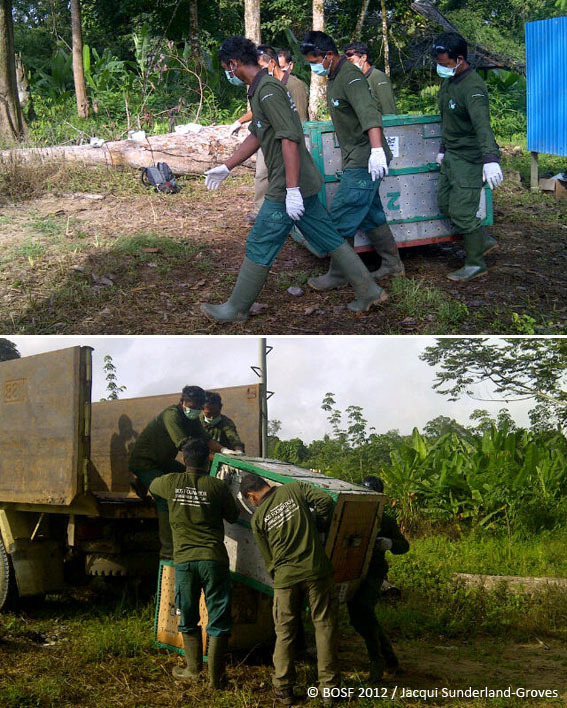 [RELEASE DAY-2] Eight Semi-Wild Orangutans Return Home! 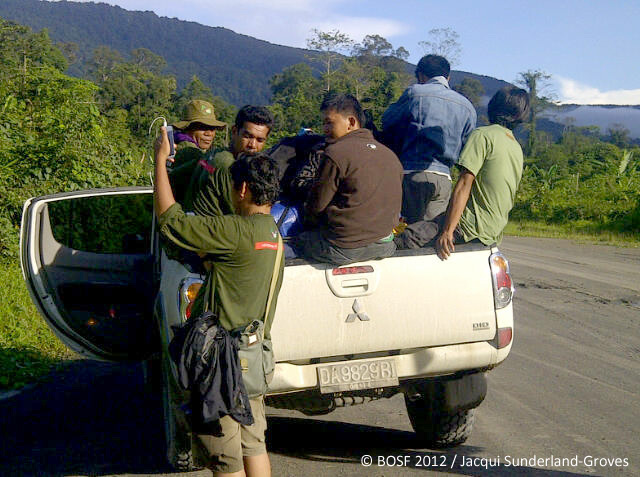 Another early start for the Orangutan Release Team in Puruk Cahu. It’s Release Day-2! At around 6.30 am, the team walked to the transit enclosures area at IMK where Anton, our Nyaru Menteng Program Manager, led them in a little prayer to start the day. The weather was on our side. It was going to be a hot, bright, sunny day. Vet Maryos got right on the job preparing sedation doses for the semi-wild orangutans – the first eight to be transported by helicopter to the forest home today. They are Paluy, Gundul, Jamal, Mangkutub, Gusti, Iyos, Kopi and Giant. While the remaining 13 orangutans, our Forest School Graduates, will spend another night at IMK and their turn will come tomorrow. The eight orangutans were divided into two groups today. The first group leaving this morning consisted of Paluy, Gundul, Jamal and Mangkutub. Gusti, Iyos, Kopi and Giant would go second. Jamal was the first to be sedated by senior technician Hendro who is very experienced in using the special dart equipment to sedate orangutans. 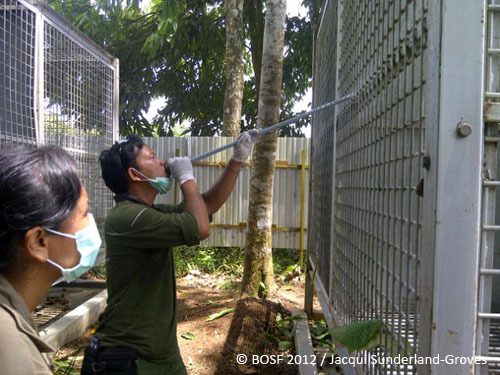 Mangkutub, Gundul and Paluy were sedated next, while the travel cages were being prepared, filled with cozy leaves for them to sleep on and food just in case they woke up and got hungry on the way to the forest. 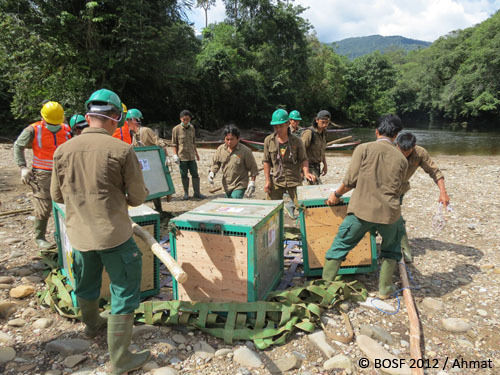 All four orangutans quickly fell asleep, were transferred into their travel cages and were loaded onto the double cab pickup for transport to the helipad where they waited for the helicopter to arrive. Not long after, the helicopter – type Squirrel – arrived. Sling load preparation began right away. 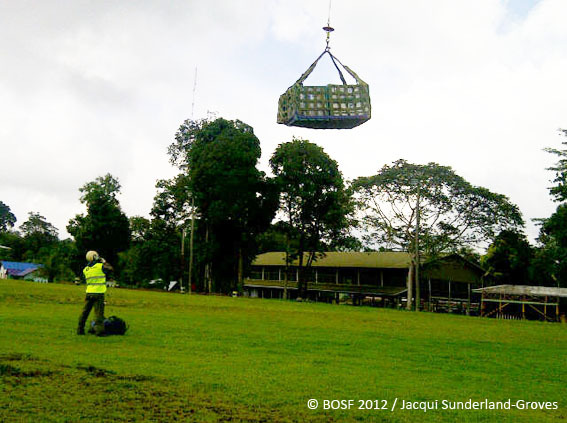 The travel cages were set on the sling load, secured properly and checked thoroughly by ground crew. 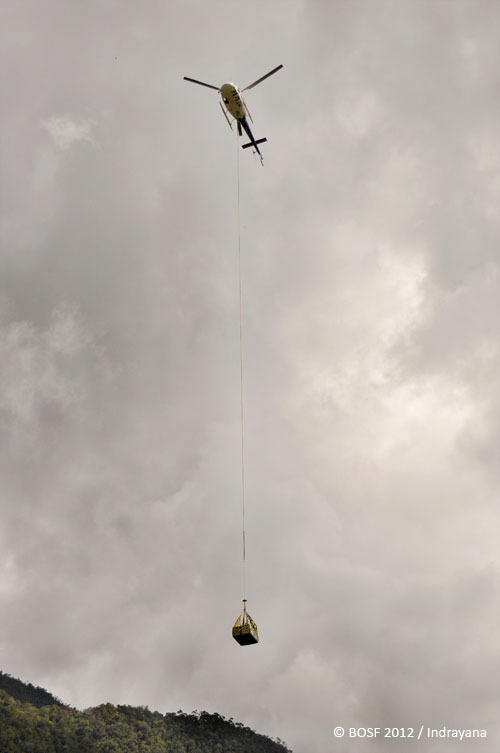 In the meantime, the second helicopter – type Bell – also arrived. 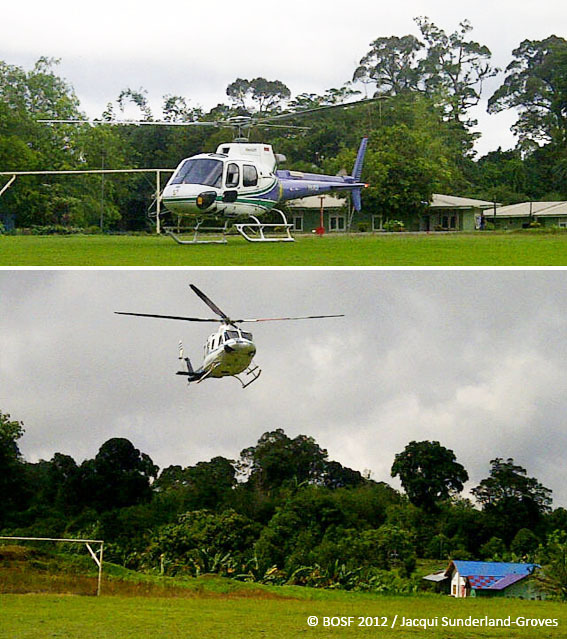 This second helicopter was to carry passengers and logistics to Batikap. All passengers were requested to watch a brief video on safety regulations before boarding. 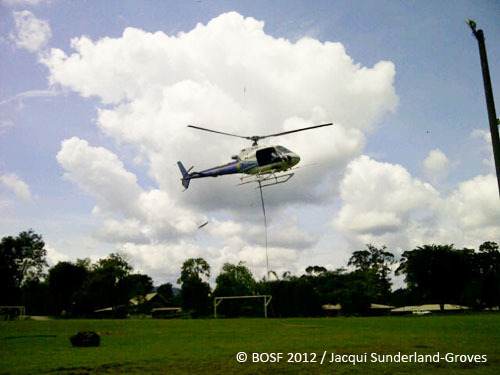 The BBC film crew also joined the first team flying into Batikap today. 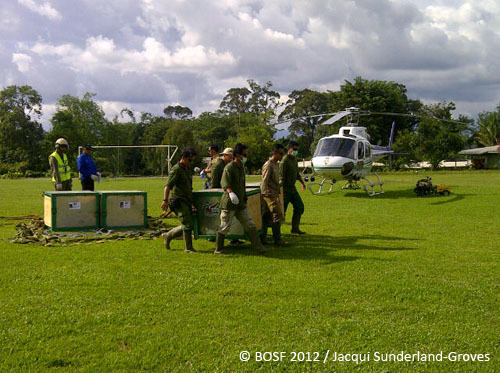 Just after 10 am, Paluy, Gundul, Jamal and Mangkutub departed on their final journey home, followed by the Release Team and BBC film crew on the second helicopter. The team in Puruk Cahu rested a bit before heading back to the transit enclosures to prepare the second group of the day. Paluy, Gundul, Jamal and Mangkutub were off to Batikap! 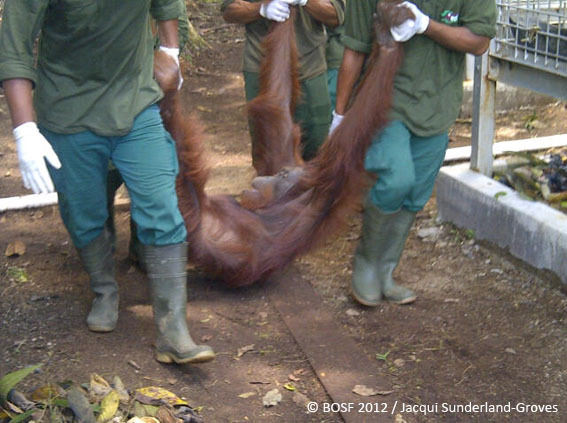 Then the process repeated; Hendro sedated the next four orangutans – Gusti, Iyos, Kopi and Giant. 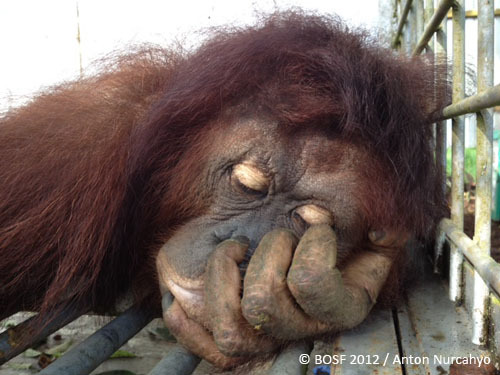 Kopi was first to fall asleep and transferred into her travel cage, followed by Iyos and Gusti. Giant, though, took time to sleep and kept waking up! But finally he, too, was fast asleep and safely put into his travel cage. 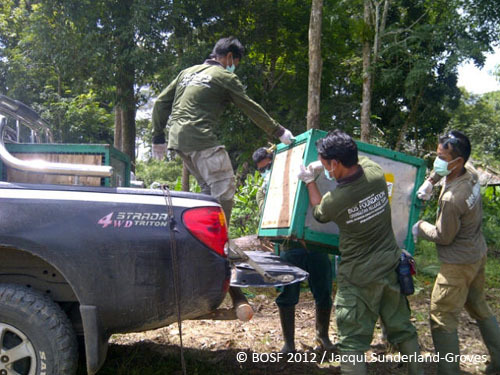 The travel cages were again loaded onto the double cab pickup and taken to the helipad. 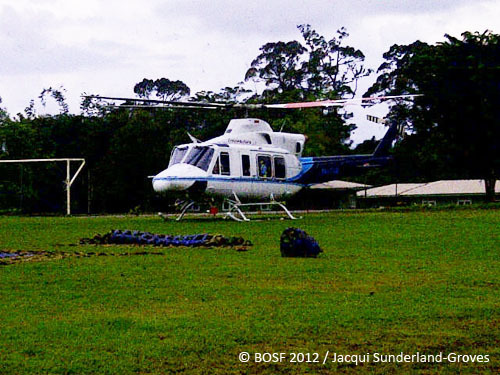 The Squirrel helicopter landed back on the helipad in Puruk Cahu at the same time we finished all of our preparation! These next four orangutans were immediately loaded on the sling load. 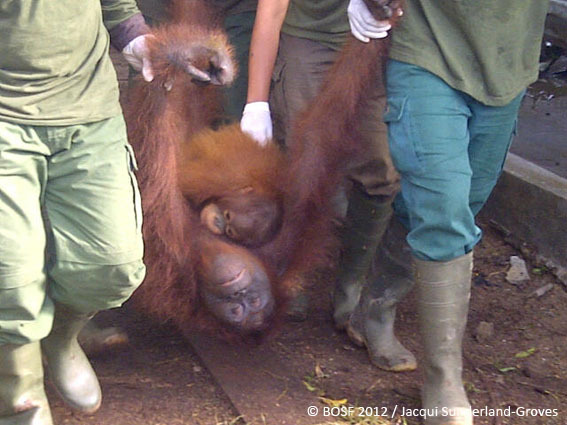 By 12.30 pm, Gusti, Iyos, Kopi and Giant were lifted off and on the way to their rightful home in Batikap. 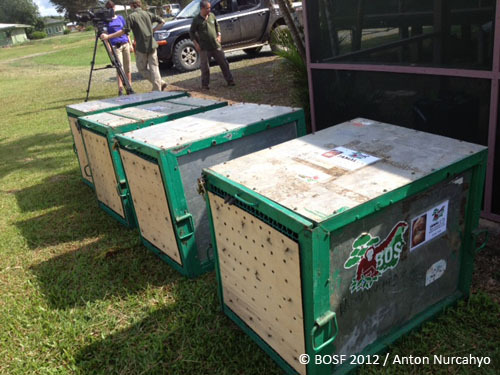 Gusti, Giant, Iyos and Kopi were on their final homecoming journey! 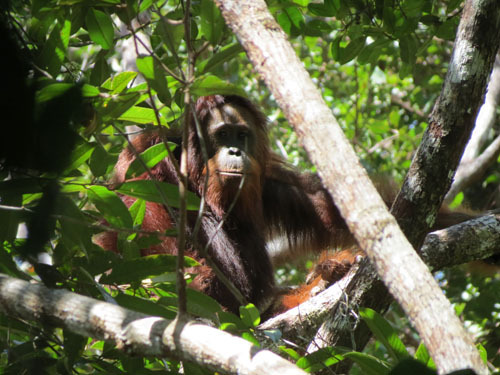 The team from Batikap reported that the first group arrived safely in the forest of Batikap at 10.51 am and Paluy, Gundul, Jamal and Mangkutub have all been released successfully! The next lot arrived at 1.20 pm. As expected, Giant was still sleepy when he arrived so he was going to be released last. 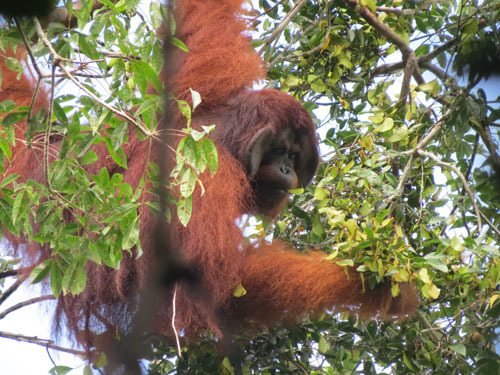 But after Gusti, Iyos and Kopi were released, Giant was awake and joined his friends in their new home. The last empty travel cages arrived back in Puruk Cahu at around 2.45 pm. Release Day-2 was completed! Have a great life in the forest, you lot! We will be keeping a close eye on you to ensure you are all healthy and happy. 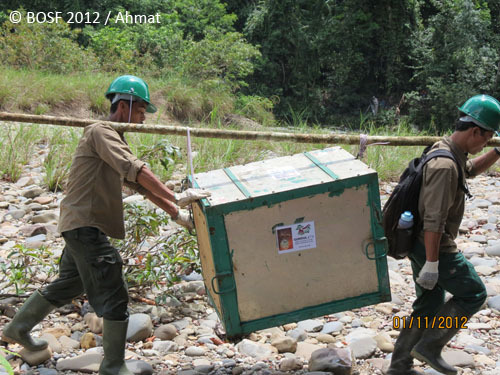 Stay tuned tomorrow for our final day of Nyaru Menteng 4th Orangutan Release activity. For the first time ever, 13 of Nyaru Menteng’s Forest School Graduates are finally going home!